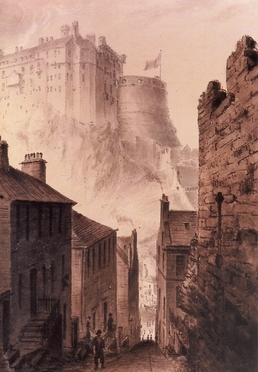 Until 1856 the Vennel was the boundary of the city of Edinburgh. To the west lay the separate burgh of Portsburgh, though since 1648 it had effectively been controlled by Edinburgh Council. The former Portsburgh Church still stands, just opposite Brown's Place. The boundary was marked by the Flodden wall, built after the disastrous Scots defeat by the English in 1513, a tower of which still survives at the top of the Vennel. Following the Union with England and the defeat of Napoleon in 1815, the Flodden wall was clearly redundant and was gradually demolished. James Brown, the owner of an inn in the Grassmarket right next to the wall took the opportunity to develop his back-lands with a square opening onto the Vennel, no doubt reusing the stone from the demolished wall. He called it Brown's Place. In 1834 Brown's Place, described as ‘newly built’ was advertised for sale along with the inn. It was again advertised in 1853 and continued to be sold as a unit at least until 1947. By the 1960s, nos 1-3 were derelict, and the whole area was scheduled for demolition to accommodate an expansion of the art college. Flats were sold off very cheaply to sitting tenants. Fortunately, these plans never happened and by the end of the decade they were abandoned. 1-3 were rehabilitated in 1976. In 1986 Brown's Place Residents' Association was founded to undertake a scheme of comprehensive repairs to the gardens, part of which had been concreted over.